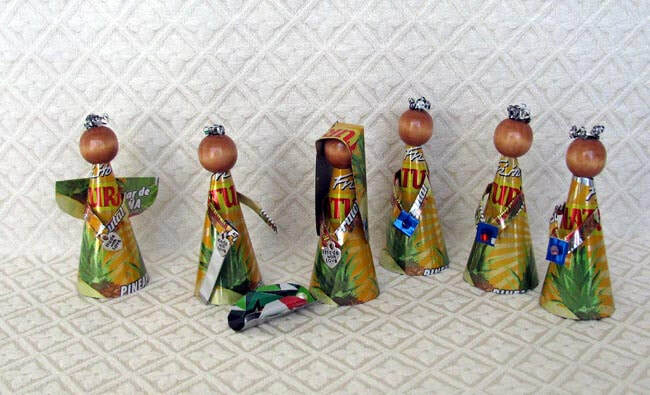 This Nativity set is made from recycled soda cans. The figures have wood faces. The set was made by Marta Lucia Zuniga in Trujillo, Honduras. The set includes Joseph, Mary, baby Jesus, an angel, and three wise men. The figures stand 4 inches tall. Lucia is known as Luci to her family and friends. She had a very difficult childhood of violent abuse and abandonment. This quiet lady has always been a hard worker and perfectionist. She and her husband Egiberto have five children. They have worked to improve their living conditions, graduating from a mud hut with thatched roof to a wooden slab house with a cement floor, running water, an outhouse, and now electricity! Luci encourages her children to be good students and study for some profession so they can have a future.